A bright spot in the just completed session of the Iowa Legislature is that lawmakers for the second year in a row have assured a tuition freeze at Iowa, Iowa State and Northern Iowa. A bright spot in the just completed session of the Iowa Legislature is that lawmakers for the second year in a row have assured a tuition freeze at Iowa’s Regents universities. The 4 percent increase in state funding for FY2015 is an important investment. It means current students will be able to keep a little more money in their pockets, and prospective students will have greater access to higher education at the University of Iowa, Iowa State University or the University of Northern Iowa. For now, the state has stalled its trend toward sharp tuition increases — a trend similar to what’s happened at public colleges and universities across the country. A new report from the Center on Policy and Budget Priorities found that from FY2008-FY14 state funding per student at Iowa’s Regent universities decreased by 23.8 percent, leading to a 12.2 percent change in average tuition after adjusting for inflation — $854 more a year per student. It’s a simple equation: When state funding goes down, tuition goes up and/or resources to help students are reduced. 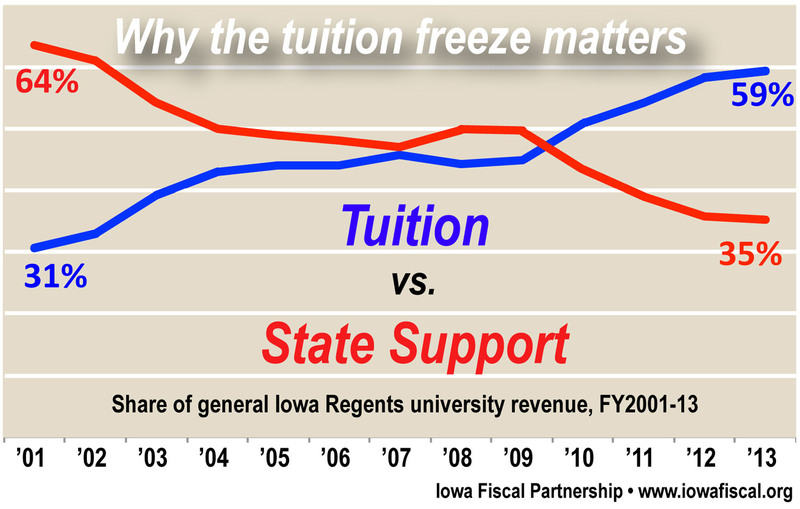 Iowa Fiscal Partnership research has shown these trends in our state, as noted in the graph below covering tuition vs. state support of Regents institutions from 2001-13. These trends shift the cost of education from the state to the students and their families. The result is that students take on more debt or have fewer choices among institutions, if they choose to attend at all. At low incomes, some students may simply choose not to enroll even though education might be what they want, and necessary to their career goals. Excessive student loan debt has broad economic implications. It is associated with lower rates of homeownership among young adults, it can create enough stress to decrease the probability of graduation and reduce the chance that graduates with majors in science, technology, engineering and mathematics will go on to graduate school. The economic importance of higher education will continue to grow, as getting a college degree is increasingly a prerequisite to enter the middle class. And beyond those who receive the degree, everyone in the community benefits when more residents have college degrees. An area with a highly educated workforce attracts better employers who pay better wages and this can boost an area’s economic success. Strong state revenues offer a time to reinvest in higher education, and to return funding of services to pre-recession levels.